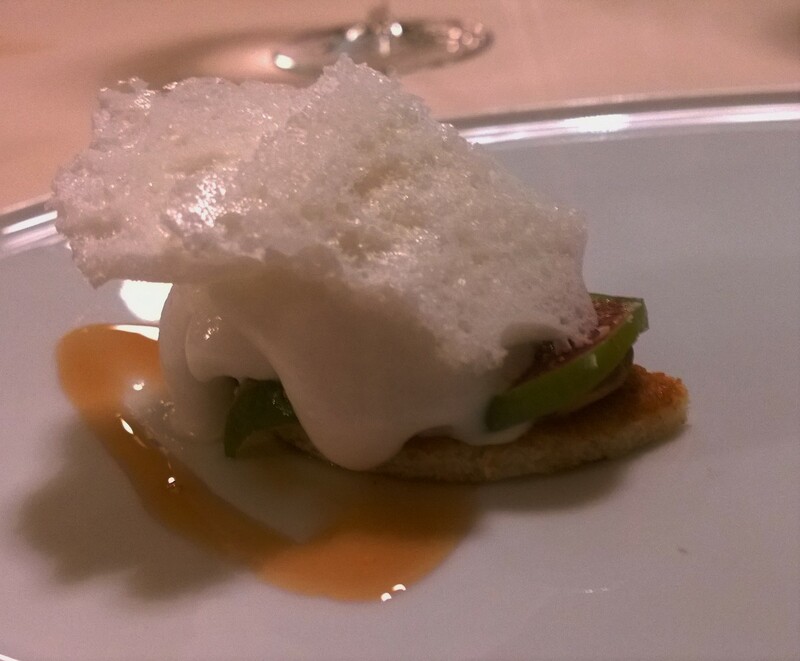 My birthday dinner over the last few years has been quite something – the last few years have featured such famed establishments as: The Fat Duck and Noma. Where do you go from there then? Well, we were in Tuscany for a holiday in October, which saw us spending a couple of days in Florence, before we headed to Siena and then walked from just outside of Siena all the way to Montepulciano where we spent another couple of days before we returned to the UK. 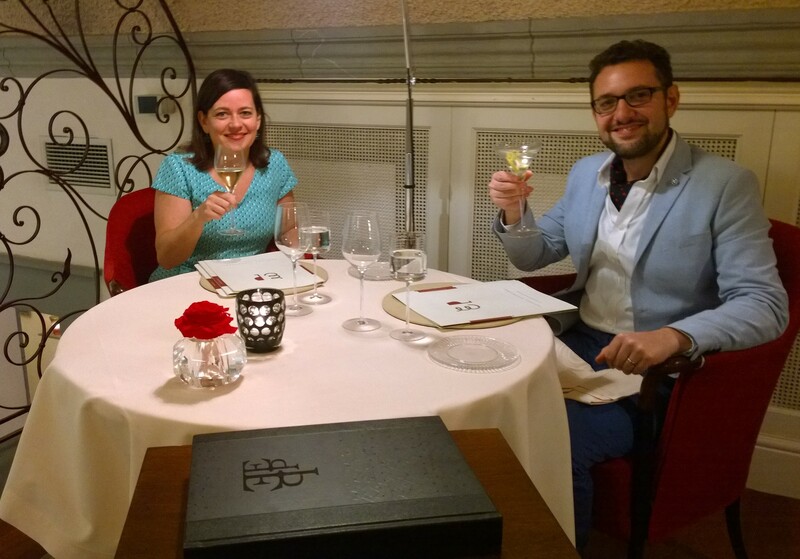 Whilst we were in Florence my wife treated me to a special birthday meal at the world-renowned, 3* restaurant Enoteca Pinchiorri. The restaurant is famed for its combination of traditional Tuscan flavours, alongside cutting-edge cooking techniques and beautiful presentation of the dishes. It is set in a beautiful Florentine building in the south-east part of Florence, not far from the Uffizi or from the Santa Croce. As we walked in we were greeted by a phalanx of immaculately-dressed waiters (I don’t remember seeing any waitresses) who all greeted us with a charming and ever-so-slightly-extravagent bueno sera. We were whisked off up some stairs, round a corridor, through a passageway, round another corner (this place really was a warren) before we were shown into a beautiful room that was set as a balcony, overlooking one of the main dining rooms. Whilst we perused the menus, we had aperitifs – I opted for a gin martini (Gin Mare gin, Martini Bianco and a twist of lemon). 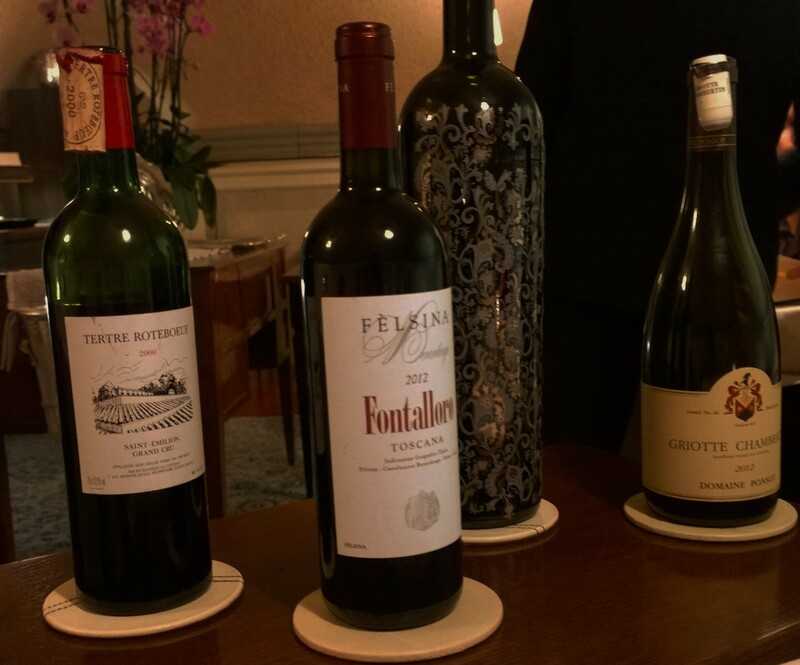 I was then presented with what I thought was the wine list, which I was a bit surprised by as it was relatively slim – imagine my surprise then when I found that what I was looking at was actually the WATER MENU! Inside was a selection of waters from around Europe (Italy, Spain, Switzerland, Germany were all covered), we decided to choose an Italian water – it seemed appropriate. For the food we decided to take the restaurant’s seven course “Discovery Menu” along with an accompanying wine flight. 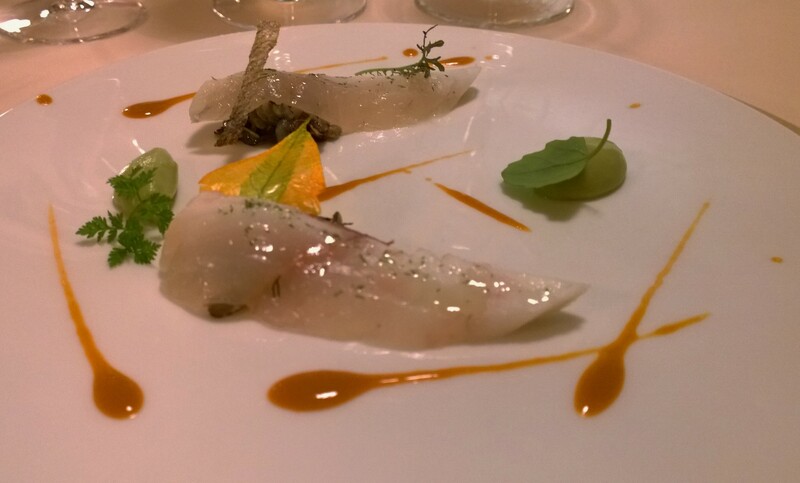 We started (after a couple of beautiful amuse-bouches) with our first course which was Sea Bream marinated in Lemon Verbena and Mint, served with Wild Rice and Fresh Garlic, Avocado and Sea Urchins. Interestingly the sea urchin had been made into the brown sauce that was streaked across the place and gave a really impressively deep flavour. The sea bream itself was barely cooked and felt sashimi-like in style; it was absolutely delicious and its cleanliness was beautifully contrasted against the depth of the sea urchin sauce. The other additions to the plate really worked too, the avocado gave a nice creaminess, which was then augmented by the texture of the wild black rice found hidden away under the fillets of sea bream. This was a beautiful dish and I was already convinced that this was going to be a fantastic meal. With this dish we had the first of our wines, which was a 2014 Marc Colin et Fils “Les Champs Gain” Chassagne-Montrachet 1er Cru (Burgundy, France) and was probably my favourite wine of the evening. It had touches of butterscotch on the nose, which were accentuated by green apple and little smatterings of lemon. On the palate it was bright and fresh with gooseberry and cool lemon flavours at first, but on the mid-palate it gained some impressive breadth and firmness to it. Our next course was John Dory bites in Squid Ink Dough served with Sprouts of Spinach, Béarnaise Butter and a Camomile Jelly. This was another absolute winner of a dish, we proclaimed it the best battered fish ever. The dark squid ink gave the tempura batter around the fish a striking black profile, but the batter was delicate and light which meant that the fish bites were not heavy or fatty, but light and delicate. The dish was served with a number of beautiful accoutrements which elevated the fish to even higher places – the combination of the Béarnaise butter and the camomile jelly was particularly impressive. Unfortunately my photo of this remarkable dish didn’t come out very well at all, so you will have to take my word that this was a beautiful presented plate, as well as being a wonderful plate of food to eat. 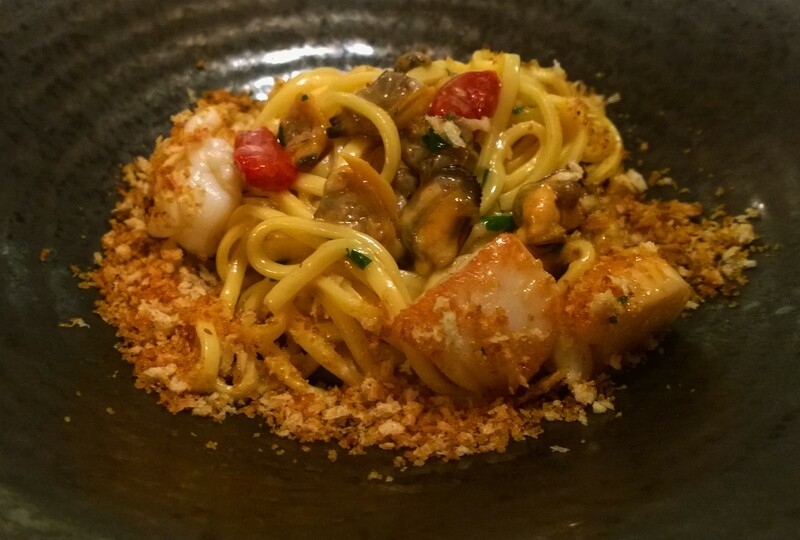 Next up was a pasta dish, Spaghetti “alla chitarra” served with Seafood, Bread Crumbs and Muggine Bottarga. I really like the presentation of pasta dishes like this on black plates as I think it gives the plate a real elegance. As would be expected of a dish at this calibre of restaurant the pasta was beautifully fresh, the seafood morsels were cooked to perfection and the sauce was very nice. The bread crumbs gave a nice texture to the dish, which added something to it. This was a very nice plate of food but paled into insignificant compared to the two stellar dishes that had preceded it. Our second pasta course was a Ravioli filled with Stewed Capon (male chicken), Steamed Prawns and Manuta Pumpkin. Once more the pasta was lovely and light and the filling was beautifully balanced. I was struck by the combination of the stewed chicken meat and the steamed prawns which worked really well together, like a very posh form of “surf’n’turf”. We had this with not one, but two, wines! The first was a 2012 Podere Poggio Scalette Stefano Ricci (Tuscany, Italy), which was made in a super-Tuscan style with 100% Merlot and served ex-magnum. The bottle was particularly impressive and it came with a specially-designed glass that matched the design of the bottle. The flavours emanating from the glass were all dark cherry, almost compote-like in intensity. I was surprised that this was supposed to be the match for the ravioli and found that it was quite a bit too heavy – clearly the sommelier felt otherwise! The second wine was a 2012 Domaine Ponsot Griotte Chambertin (Burgundy, France) which worked much better for me in terms of matching; it also had intense dark cherry on the nose with sandalwood sweet-spice notes, however on tasting it was much lighter than the Ricci and had juicy, plump plum flavours going on with a little more acidity, which balanced the ravioli a little better. The first of our meat courses was a Veal Loin cooked in the pan with Fresh Pepper Corns, Radicchio, Potatoes, Radishes, Borrettane Onions with Butter and Tarragon. This was a one of those dishes that for me encapsulates this kind of high-end cooking; everything was cooked to perfection, the dish was assembled beautifully, with colours bright and a nice stacking of the ingredients to create height. Eating it was just a lot of fun and very enjoyable. This was clever in its sheer competence, rather than in showy ingredients and fancy techniques – properly, properly good cooking. With this we had our second Tuscan red, a 2012 Felsina Berardenga Fontalloro (Tuscany, Italy) this time a more traditional (100% Sangiovese) ; which was heavily perfumed and really powerful. Dominant flavours were, as you would expect, dark cherries and plums; with some nice sweet spice notes. 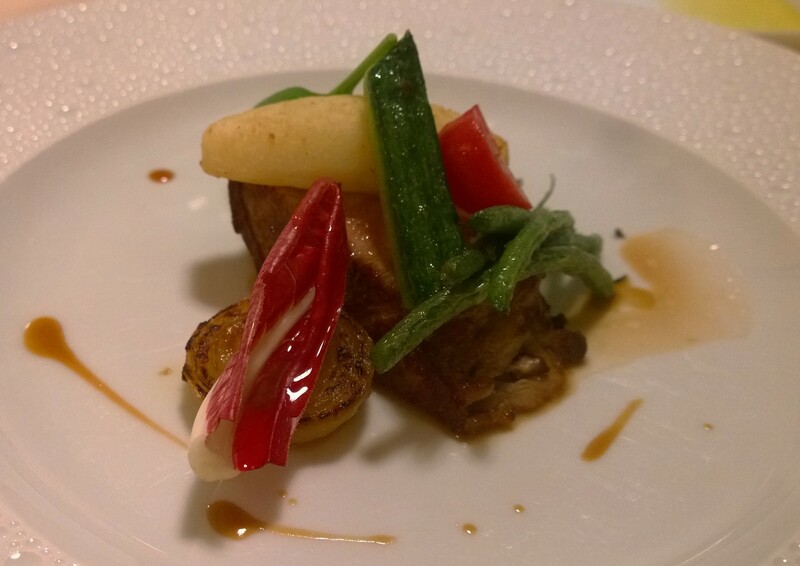 The last of our savoury courses was the “Mora Romagnola” Pork served with Carrots, Cumin and Sweet-and-Sour Shallots. What made this dish special was the pork which was a beautifully tender suckling pig. Unfortunately, I forgot completely to take a photo of this course – something to do with the generous wine portions methinks! 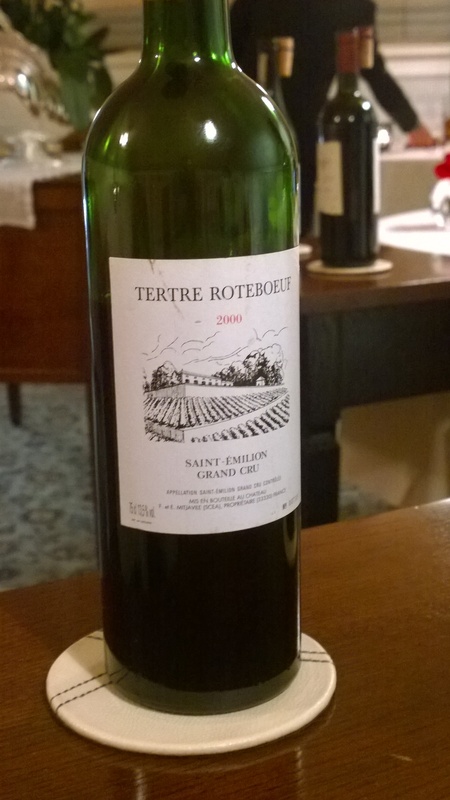 Talking of that, our last wine of the evening was a 2000 Tetre Roteboeuf Grand Cru (St. Emilion, Bordeaux) which had aromas of blackcurrant, loganberry and hawthorn on the nose. When tasted, however, it was scarcely believable that this wine was 16 years old, it was so fresh and fruity and positively sang in the glass. As the flavour lingered it then started to develop some secondary, savoury mid-palate flavours, which worked well to balance the pork. I wouldn’t have thought of a mature, right-bank Bordeaux to match against a pork dish, but I think this was paired magnificently. Our first pudding course was once more magnificent in its straightforwardness – Marinated Figs served with Almonds and Milk Flavoured with Mint. The dish, I thought, was not the most visually attractive, but the flavours and textures were very good. I thought that the idea of turning the milk into something of a semi-fredo, which gave both a nice textural and temperature contrast. In truth, by this point however, the wine had softened some of my critical faculties I think. 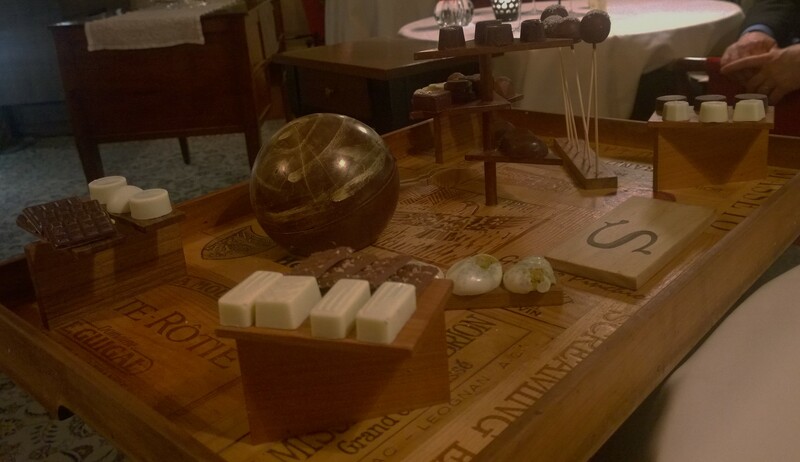 Just when we thought we were winding down, we were presented with one final surprise – the most delectable of chocolate selection trays that I have ever seen! As you will see from the picture, this was like something from Charlie and the Chocolate Factory. There were so many beautiful little morsels that you can select from, but the most fun was the chocolate orb which my wife was given the honour of breaking into. This was nice contrast after all the serious business of the high-end food and wine, it took us back to that “kid in the sweetshop” sensation, getting us all giddy with excitement about our food. This was a properly fun meal with everything glorious excess, whilst retaining the fine dining, classically beautiful experience. The food was of great quality, I’m not sure I’d say that it was the best that I had ever eaten and some of the 2* restaurants that I’d eaten in I’d say were better than this; nonetheless, every course was well judged, well made and well executed. The wine selection was sublime and the attention to detail given with the presentation of the wines on the table, plus the occasional bonus wine, really tickled my wine geekery. Above all, however, it was the personable demeanour and attention from the staff that made this dinner special – they really did serve to augment the whole experience. Of course, the last word will always belong to my darling wife who treated me to this gastronomic extravaganza. As I started this post, I will end it – I am one lucky man. Happy Birthday and what a wonderful meal to celebrate the evening. The dinner and wines sound well thought out and creative.